You can easily accelerate the growth of your business with development of better communication skills. Your ability to leverage your efforts in business, through your employees is strongly determined by how effective your communication skills are. This awesome effective communication skills pdf is written from direct experience of operating seven businesses spanning over thirty years. 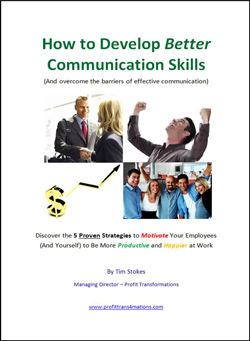 It contains five proven, productivity increasing communication strategies you can implement into your business instantly and see a significant boost of productivity and profit in just weeks. This book discusses barriers to effective communication, what causes these barriers and how they can be overcome. The five strategies it contains are uncommon ones often not recognized or discussed, yet for eighteen years these effective communication skills and strategies have been the foundation for hundreds of our business clients phenomenal growth and success in business. Without being effective with communication its very hard to leverage your efforts and work at a higher level in managing your business. This book gives you the insights necessary to develop not just your own communication skills but also those of your supervisors and managers as your business grows and expands. Grab the book How to Develop Better Communication Skills through the form below and start conquering the barriers to effective communication today.